Joe Perry beat Thepchaiya Un-Nooh 4-1 in the final of the Xuzhou Open to win his second Asian Tour event. Cambridgeshire’s 40-year-old Perry, who has found the best form of his career in recent seasons, compiled breaks of 60, 51 and 66 to beat Thailand’s Un-Nooh and claim the £10,000 top prize in China’s Jiangsu Province. It’s the second time Perry has won a tournament which counts towards the world ranking list, having won an Asian Tour event in Yixing last season. 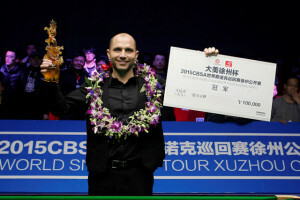 The world number 13 was also runner-up at this season’s Wuxi Classic. “It’s always a surprise to win a tournament because the standard is so high,” said Perry. “Some of the Chinese amateurs in this event were as good as professionals. “We both missed a few balls early in the final, but once I settled down I played well and controlled the match. I felt that if I could cut out the mistakes and keep my safety good then I would get chances. Earlier in the semi-finals, Perry came from 3-2 down to edge out Tom Ford 4-3 while Un-Nooh reached his first pro final by beating Mark Williams 4-1.